The Birth of America series continues with The American Revolution. In 1775: Rebellion, players take the roles of the American Continental Army and Patriots against the British Army and the Loyalists. Each side tries to control the colonies, provinces and territories. They call on the aid of Native Americans, as well as the German Hessians and French Army in order to successfully birth a revolution or quell the rebellion. The four factions each use their own deck of cards to move their units into postions. Battles are resolved quickly with custom dice. If you can control an entire colony, province or territory you raise a flag. When the game ends with the signing of the Treaty of Paris, the side with the most flag markers is the winner. 1775: Rebellion uses the same basic mechan.. 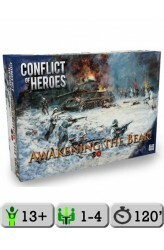 Awakening the Bear is the first game in the multi-award winning Conflict of Heroes series. In it, players control individual squads and tanks to resolve the same tactical dilemmas and decisions that commanders faced during some of the most ferocious engagements of WWII. CoH features a fast and fluid system that is easy to learn but realistic to all of the unique theaters of battle portrayed. Fun: Quick simultaneous play allows players to interact without waiting. Easy: Teach a new player how to play in under 5 minutes. No charts! Historically Accurate: Portrays realistic forces and tactics. Counters: Depict individual vehicles, airplanes, guns, squads and more. Consistent: Each game in the series uses the same rule system. 2nd Edition includes all new artwork, more uni.. Early in the history of the United States, slavery was an institution that seemed unmovable but with efforts of men and women across the country, it was toppled. In Freedom: The Underground Railroad, players are working to build up the strength of the Abolitionist movement through the use of notable figures and pivotal events. By raising support for the cause and moving slaves to freedom in Canada, the minds of Americans can be changed and the institution of slavery can be brought down. 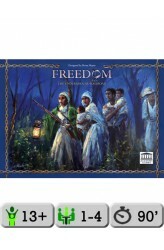 Freedom is a card-driven, cooperative game for one to four players in which the group is working for the abolitionist movement to help bring an end to slavery in the United States. 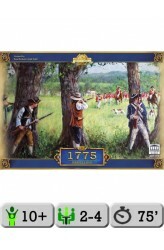 The players use a combination of cards, which feature figures and events spanning from Early Independence until the Civi..